September is National Ovarian Cancer Awareness Month, which makes it a good time to learn more about this disease. Ovarian cancer often goes undetected until it has spread within the pelvis and abdomen. At this late stage, it's more difficult to treat and frequently is fatal. 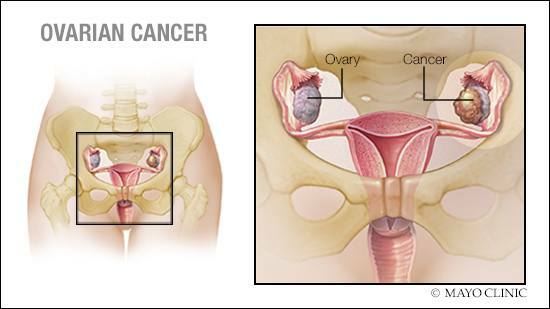 Early-stage ovarian cancer, in which the disease is confined to the ovary, is more likely to be treated successfully. Factors that can increase your risk of ovarian cancer include your age, family and genetic history, and use of estrogen hormone replacement therapy. What do you know about ovarian cancer? Cancer spreads, or metastasizes, when cancer cells break away from the original tumor and travel through your bloodstream or lymphatic system to other parts of your body. The appearance of cancer cells and the way they spread vary depending on the type of cancer, and not all cancers metastasize. This video shows how a type of skin cancer called melanoma can metastasize. If the first therapy to treat your prostate cancer doesn't work, there are other options available — with a few exceptions. Learn more from Dr. Erik Castle, a Mayo Clinic urologist.